On October 20, 2018, President Donald Trump announced that the United States would withdraw from the bilateral Intermediate-Range Nuclear Forces Treaty (INF) with Russia. The INF was signed by former U.S. President Ronald Reagan and former USSR President Mikhail Gorbachev in December 1987. The treaty eliminated 2,692 land-based missiles with ranges of 500 km to 5,500 km. On February 1, 2019, the United States suspended its participation in the treaty, and Russia responded by withdrawing from the treaty the following day. This comes at a time of heightening belligerence by the United States and its allies against countries beyond the ongoing military operations in the Middle East. Particularly since the Ukraine/Russia crisis of 2014/15, current targets include Russia, China, Iran, North Korea, and now Venezuela. The Bulletin of Atomic Scientists has set the Doomsday Clock to 2 minutes until midnight: military strategy from the U.S., its NATO partners, and Israel, appallingly includes the first-strike deployment of nuclear weapons based on a belief that a nuclear war is winnable and that nuclear weapons can be used like conventional weapons. The abrogation of the INF Treaty follows the massive $1.1-trillion investment in nuclear weapons by former President Barack Obama, and it comes as the Trump administration opens the possibility of Saudi Arabia’s development of its own nuclear weapons arsenal. The end of the Cold War was a pivotal turning point in world history, a time when nuclear weapons should have been eliminated and when the level of atmospheric greenhouse gases could have been maintained at a safe level. Instead, the United States took the lead in expanding NATO and persisting with energy and economic policies that accelerate greenhouse gas emissions. The United States has long claimed a number of entitlements for unilateral foreign policy interventions which allow a wide range of measures to protect oil supplies and to undertake military actions with impunity. Since the 1990s massive expansion of the American overseas military capabilities, the U.S. is now estimated to be operating some 800 to 1000 military bases worldwide. Indeed, the U.S. now appears to be engaged in ‘permanent war’, with any number of interventions in contravention of international law (such as it is) – wars that have come at the cost of millions of lives. The United States has driven the arms race: it detonated the first atomic bomb, built the first ballistic-missile-launching submarine, assembled a massive stockpile of strategic missiles and multiple warheads, and developed computerized guidance systems for weapons (including drones and others). The United States refused to ratify the UN Conference on Disarmament’s Comprehensive Nuclear Test Ban Treaty (final draft in June 1996). In 2002, G.W. Bush made the unilateral decision to abrogate the Anti-Ballistic Missile Treaty with the Soviet Union which subsequently led to the development and installation of missile defense systems. The work of Theodore Postol, professor emeritus of Science, Technology, and International Security at the Massachusetts Institute of Technology, suggests that installed missile defense systems surrounding Russia and China are easily convertible to offense and that their close range falls within the INF Treaty. He writes that missile defense deployment of weapons is undetectable by current Russian and Chinese technology, leading to a scenario in which these countries could launch a pre-emptive strike without having full knowledge about whether there actually is an imminent threat. The Cold War strategy of Mutually Assured Destruction (MAD) no longer deters nuclear warfare. Missile Defense provides an incentive to both sides to launch first strike annihilation before a retaliatory strike is possible. In Canada, there is little knowledge about Canada’s active participation in building missile defense systems or Canada’s involvement in nuclear weapons proliferation. In 1963, former prime minister Lester Pearson signed an agreement with the United States to acquire nuclear warheads for its Bomarc ground-to-air missiles. In violation of the Nuclear Non-Proliferation Treaty, Canada supplied India with the technology for making its nuclear weapons. Canada contributes RADARSAT remote sensing technology for NATO’s missile defence system, and most recently participated in provocative NATO war games close to Russia’s and China’s borders. Canada did not participate in any of the preparatory meetings in Oslo (March 2013), Nayarit (February 2014) and Vienna (December 2014) leading to the nuclear ban treaty. 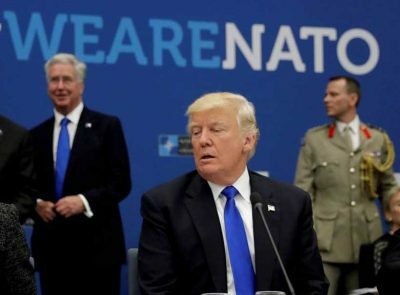 Dismantling NATO and the entire military/industrial complex urgently needs to be in the forefront of political education and action, especially with the ominous shift to militarized authoritarianism in much of the world and the willingness to launch nuclear war. Canada’s hypocritical self-image as a ‘peace-loving decent country’ blinds the public to Canada’s role, and the aggressive interventionist policies being pursued by Prime Minister Justin Trudeau and Minister of Foreign Affairs Chrystia Freeland. Street protests by the ant-war movement have at times been large and worldwide but have had limited effect in eliminating nuclear weapons or, without sustained and long periods of organizing, in stopping war. Nor have the growing climate justice and ecological movement at this time made any dent in decreasing overall greenhouse gas emissions, the other threat to all human life. At present, there is no cohesive anti-war movement in either Canada or the USA. Nuclear war, climate disaster, and extraordinary poverty are appalling atrocities that require united, cooperative, informed, courageous, and unrelenting opposition. It is a crucial test of the emerging socialist and green movements in North America to rebuild peace and international solidarity movements capable of challenging North American imperialism and the new arms race.